This illustration, like the upper part of the preceding one, comes from Urzahl und Gebärde by Hugo Kükelhaus. This book is not, strictly speaking, a book on harmonics, since Kükelhaus hardly discusses the tone-ratios of the numbers; but in his method of number observation he is completely in the spirit of Pythagoras and Kepler, and much of the material in his book contributes to a qualitative observation of numbers. 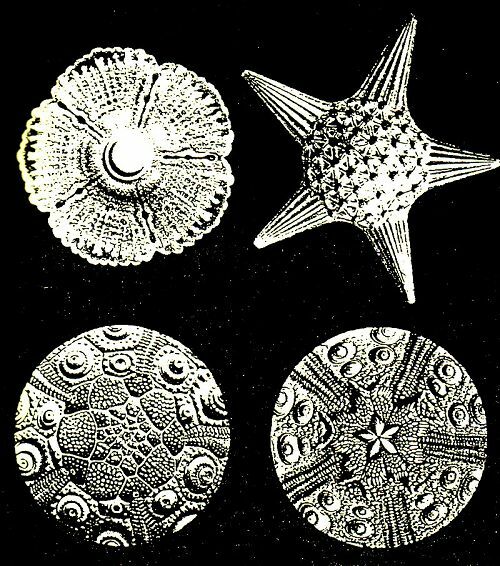 The image shows sea creatures: sea urchins and a starfish. In the sea, the “cradle of life,” the number five appears here morphologically in a most pronounced and unequivocal manner, the foreshadowing of the five fingers on the human hand, with which Creation takes hold of the world. Paleontology has also proved that the ancestors of all mammals today definitely had five toes, and that only through later specialization, such as in the horse, was one discarded.